Our domain reseller storefront is a turnkey solution that will enable you to be a domain name reseller instantly. Customise your storefront, set your pricing and take your profits. You can choose to resell domain names, hosting or our leading industry products. The storefront reseller plan gives you everything you need to start your own successful business. The reseller storefront is a complete ecommerce site with payment processing offering Crazy Domains products and services under your own branding. Also comes with a control panel to manage your orders and customers. Making sure you have all the tools you need to operate a successful business. Decide the pricing for YOUR products! You have total profit control-set your retail price for each and every product. No deposit, minimums or advance purchase required. Simply customise your Storefront to suit your business image and style with full CSS control. Everything is branded with your company name, from copyright notices, emails and order confirmations, to your customers management interface for all domains, hosting and products. The reseller console gives you a complete control to setup and manage your own customers with easy access to orders, payments, pricing, domains, hosting and products. Your customers will also have a client login area for them to manage their own domains and products under your account. Crazy Domains is a certified ICANN accredited registrar connected with the top level domain registries. Crazy Domains will continue to expand on the collection registries and new domain extensions, ensuring you always have the latest and greatest to sell. Our Dedicated Partner Channel offers you a 24/7 Premium Support service, who are always available to assist you with technical issues, promotion ideas and account management. We can also offer 24/7 support for your clients if required, so you can focus on growing your business, rather than supporting it. All billing and renewal services for your customers will be processed through the Pay Express gateway or PayPal gateway and credited to your account upon payment. The notification agent will handle all email reminders for renewals and billing invoicing to your clients when required. Accept payments for Visa, Mastercard and Amex using the secure Pay Express facility which will instantly credit your account when processed or connect your own PayPal merchant account within seconds with our PayPal Certified instant integration. Fully supports WHMCS integration for billing and support solutions for resellers who like a different flavour of domain and hosting management. Get started instantly! Sign up below and your account will be activated within 48 hours. As a Crazy Domains reseller partner you will not only benefit from wholesale pricing but also from the Dedicated Partner Channel set in place to help you grow your business. This is your brand, your business. In terms of pricing, you are the boss adjust your pricing and create your own promotions. These are your customers and we are only your reseller domain registrar and supplier. It's a dream come true. Match this with our leading domain reseller platform, unbeatable pricing, customisable storefront, instant domain name approvals, and our competitors really have little to offer! Enjoy unbelievable wholesale pricing across all domains, hosting and products. This is a standard once of initial setup fee and administration fee. Can I connect my own domain to the Storefront? This is your storefront and your brand! 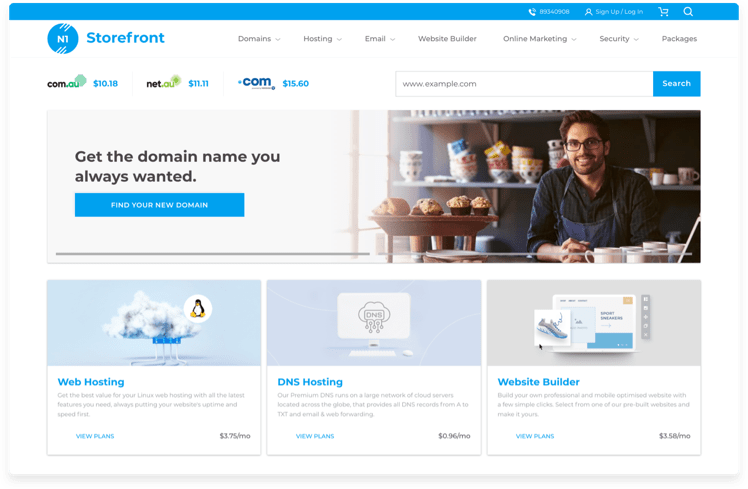 You can set any domain name to host your storefront website. Everything is always branded to you. Just how a white label reseller solution should be. What's your commission payment process? You can request payment anytime. Commission payments are made at the end of each calendar month. You will be required however to hold a retainer of $100.00 in your account to avoid a negative balance if a customer refund is needed. Can I fully style and edit the reseller storefront? Yes! You can customise the complete CSS to make your storefront your own. For example, you can add your logo, determine which products and promotions to showcase, and adjust the page layout, color scheme, navigation menu, and more. For full customisability you can also use the API solution.